Nine summers ago, I found myself walking around London trying to find ways to entertain and feed (then two-year-old) Otis. P was doing research for his dissertation, which left Otis and me with weeks to explore the city. As I pushed Otis' stroller through Notting Hill one morning, we stumbled upon a charmingly narrow and bright storefront with plates of tantalizing goodies in the window. After we went inside, I knew we were on to something. We chose spicy salads and baked treats to nibble on and wandered downstairs to the single communal table and settled in. The food was good - I mean really good. And the coffee was perfect. We ended up eating at Ottolenghi twice a day for the two weeks we were in London. On our final visit, the owner said that they had opened the week we arrived in London. He told us we were Ottolenghi's first regular customers. In these past 9 years, big things have happened for Yotam Ottolenghi - now with 4 locations and 2 cookbooks, Ottolenghi is beloved not just in London, but globally. Last week, Yotam came to the East Bay for an event at one of my favorite local restaurants, Camino. The evening was full of great food. And I was thrilled to reconnect with so many people from home (who just happen to be fans of Ottolenghi too.) Russ, the chef/owner of Camino, served a delicious dinner inspired by Ottolengi's new book Plenty. One of the many luscious dishes on the menu was wild mushroom parcels. Now, thanks to my newly purchased copy of Yotam's book, I can share the recipe with you. Cut six large squares of parchment (standard parchment allows for squares that are just shy of 13" x 13"). Scoop an equal amount (about one heaping cup) of the mushroom mix into the center of each parchment square. Gather the edges of the paper and tie with kitchen twine. 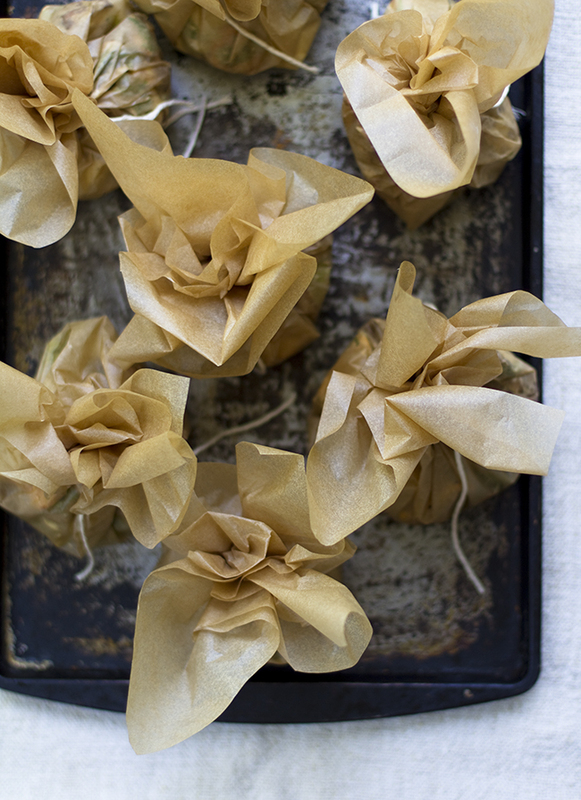 Place uncooked mushroom parcels onto a baking sheet, and transfer the sheet to the hot oven. It's fun to place a wrapped parcel on every plate, so each diner gets the thrill of discovering the herby deliciousness inside. How fun that you were Ottolenghi's first regular customer! You certainly were onto a good thing as all of his dishes are fantastic. The mushroom parcels look fantastic too. I've looked at the recipe many times in my copy of Plenty but have yet to make it yet. I served the mushroom to my family tonight and they were happily devoured - success! I cannot wait to do more cooking from Plenty. Do you have a favorite recipe? Oh, marvelous! Those püarcels are awesome. I bet those mushrooms taste like heaven. For mushroom lovers like me, this looks so delicious. What whimsical packaging to entertain and delight diners. You must have had an awesome time roaming through London streets and what a connection to that restaurant. This looks so wonderful, I love mushrooms so much, and I love how it's all wrapped up! Ooh it's my favorite food! And it looks like a coarse version of duxelles, my favorite version of my favorite food. These look lovely, almost as lovely as the story that goes with them. I can picture walking through the same neighborhoods you walked, taking in the sounds and sights, albeit several years after you. Yep, lovely. Emma, Mal, Sarah, and Rosa, great to hear there are so many mushroom-lovers out there! Must say, Ottolenghi's technique is so easy and festive at the same time. Hope you enjoy! I have to confess that when I saw the word "OTTOLENGHI" I thought it's a breed of mushroom that I'm not familiar with ^_^. This looks so good Erin. And I love that 1st photo of the cute little parcels! That is such an awesome story. I really like Ottolenghi - though I have to admit I prefer his savoury recipes to the sweet (except the carrot cake in The Cookbook). Might have to try this with some of the local wild mushrooms - we get amazing chanterelles in the forest. 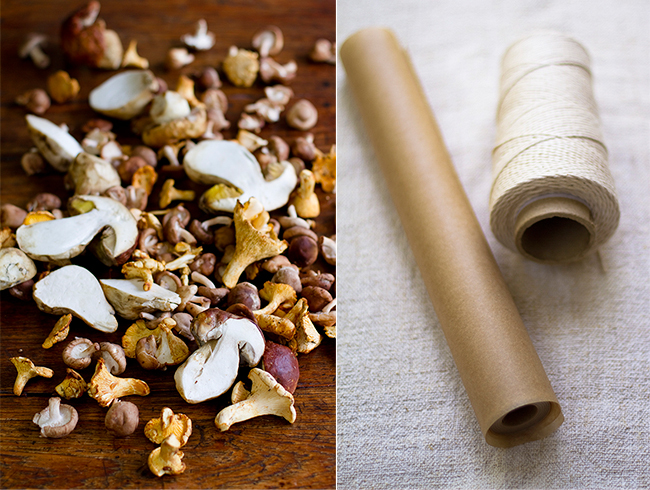 I love mushrooms and I love the ease and elegance of these wonderful little parcels. I love parchment paper. It can do so many things and make you look like you worked your behind off in the kitchen. It's one of my favorite kitchen "tools". I have a perfect memory of walking from the tube station to Ottolenghi each day in London, after another mesmerizing visit to the rare books in the British Library. There was my happy little family, drinking babyccinos and eating some delicious concoction like braised eggplant or sauteed asparagus. We have found many happy places together, and Ottolenghi is certainly one. oh yeah. welcome back is right. what a beautiful photo to wake up to this morning. those magnificent parcels. and i love that you took a photo of what yotam wrote. beautiful post. and so happy to have you back. Emma, thanks for the interesting tip about Ottolengi's savory vs. sweet recipes. I trust you when it comes to all things pastry! And lucky you on the wild chanterelles. Oli, parchment has become one of my favorite kitchen tools as well. Great for rolling out sticky dough and cute parcels are always fun! Pouke, Thanks! Good to be home. Phyllis, I loved getting to sit next to you at the Ottolengi event - such a great evening all around. Not sure my mushrooms turned out as well as Russ's, but a girl can try! Oh, too funny! I was *just* looking at my copy of "Plenty" and deciding which recipe to make. I was leaning toward the green gazpacho, but that mushroom recipe looks divine. Must have been a fun dinner at Camino! I was voyeuristically following along on Twitter...ha. What was on the menu? Carolyn, You're so right...having the juices enclosed in the parcels really does make for tender mushrooms. Plus, when you open up the parcels, the herby aroma exhales from within. Yum! Alison, Such coincidence:) I was tempted by the green gazpacho as well. Doesn't it look good? And the meal at Camino was simple, delish and packed with veg. Caramelized fennel, lentils, mushroom parcels, and so much more - all good! I didn't miss meat one bit. I love beauty and simplicity of this recipe, one of my favorite mushroom dishes is very similar to this one, only mushrooms are sauteed and then finished off with cream and fresh herbs, really good! M, mushroom, herbs and cream... always good, right? Those mushrooms made my mouth water and it is 7:00 in the morning! Beautiful pictures and loved the story as well. I just had something like this at a very fancy wedding and thought they were so clever! I love cooking in parchment, but I never thought of a little personal mushroom packet. So special and intimate - like a little present! Jamie, I agree about the "little present" vibe with parchment packets. They are so simple, yet feel really festive!